New York, June 19th, 2017: Quiet Mark, the international award programme for excellence in low-noise technology and solutions to unwanted noise, today announced the company’s focus on North America timed to the U.S. theatrical premiere of director Patrick Shen’s feature documentary film In Pursuit of Silence, a critically-acclaimed, meditative cinematic exploration of our relationship with silence and the impact of noise on our daily lives. 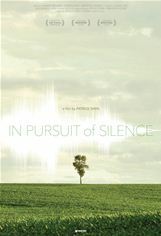 Leading film distributor Cinema Guild will present the U.S. theatrical premiere of In Pursuit of Silence, with openings in New York on June 23 at Cinema Village and in Los Angeles on June 30 at Laemmle’s Ahrya Fine Arts Theatre, followed by a release in select cities across the U.S. The pioneering work of Quiet Mark, associated with the U.K. Noise Abatement Society charitable foundation founded in 1959, encourages companies worldwide to prioritise noise reduction within the design of everyday machines and appliances, providing consumers and industry with a trusted mark of approval to help transform the aural environment for the benefit of all. Quiet Mark is already working with many leading U.S. and Global brands including Electrolux, Bosch, Dyson, Interface, Logitech, Samsung, Siemens. Quiet Mark is featured in the film, which was independently produced and financed by filmmakers Patrick Shen, Andrew Brumme and Brandon Vedder. Quiet Mark is a commercial company which shares the same charitable remit as the Noise Abatement Society and financially supports its work. The company is now starting award approvals within the U.S. partnering with business and civil society to help improve the aural environment for Americans. In Pursuit of Silence was a critical hit at festivals around the world, including SXSW and Sheffield Doc Fest. Kate Muir of The Times of London wrote, “Patrick Shen has made a fascinating documentary…which stops the viewer short in the horrendous cacophony of the modern world. As much an aural as a visual experience, it shows that the healing powers of silence are not about soundlessness (impossible with the beat of your own heart), but the right sort of sound, displayed in various forms.” The documentary looks at how, in society’s race towards modernity, amid technological innovation and rapid urban growth, silence is passing into legend. As much a work of devotion as it is a documentary, In Pursuit of Silence is set to change the way we think about our aural landscape. Quiet Mark, also featured in the film, is recognised for its groundbreaking award programme with noise and pioneering sound-quality testing, as well as its development of a clear award-system for quietest products and efforts to establish noise reduction as a key consideration in new product development. The distinctive purple Quiet Mark symbol, which was launched in the U.K. in 2012, is awarded following rigorous testing and approval from their team of principal acousticians. BMWi’s ‘Sound Cathedral’ and pioneering electric cars; Virgin Atlantic’s ambitious noise-policy target to reduce its noise footprint by 50% by 2020; Dyson’s multi-million investment in sound-engineering of its products; and Miele’s decades of leadership on sound quality as a core value. Poppy Szkiler, founder and managing director of Quiet Mark and Executive Producer of the feature film, comments “In Pursuit of Silence has been a labor of love. It brings together Patrick’s profound talent, sensitivity and courage to expose, for the first time, one of the most serious health issues facing society today. “Quiet Mark’s independent role was invaluable, thanks to our unique position of working on behalf of consumers to identify the best noise reduction from industry available, whilst underlining Government policy to drive awareness and support the reduction of noise-related issues. We strive to bring insight to technology brands who are already doing their best to reduce the noise levels of their products. They are playing an important role in creating a more healthy aural environment by improving the quality of sound and impact of noise in people’s lives. In our stressful lives, we are surrounded by a cacophony of sound that we have little power to stop. The louder the noise around us, the more energy we waste to overcome it, and it is getting worse day by day. If we don’t do something about this soon, our ability to hear the subtle sounds around us will disappear. Quiet Mark has embarked on a journey to transform the situation, to create a demand for the use of quieter technology in our homes, workplace and outdoor environments. Quiet Mark, associated with the Noise Abatement Society charity, sprang from the response to public complaints received by the Society’s 24/7 national noise helpline, concerning the volume of excessive noise made by household tools, appliances and technology which invade the fabric of everyday life. Quiet Mark brings the answer with a universal symbol and system of support for consumers and industry alike to help transform the aural environment for the benefit of all by commending a selection of the quietest technology currently available on the market.